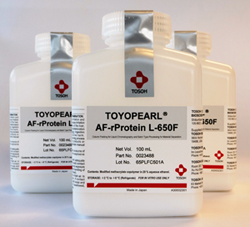 Tosoh Bioscience LLC, a provider of chromatographic resins for the purification of biopharmaceutical drugs in commercial manufacturing processes, has announced the introduction of TOYOPEARL AF-rProtein L-650F, a Protein L resin that exhibits the highest binding capacity for antibody fragments that lack an Fc-portion (e.g. Fab, ScF Dab, etc.). The chromatographic resin is available for sale in the Americas from Tosoh Bioscience LLC. TOYOPEARL AF-rProtein L-650F resin offers the highest binding capacity and also has the ability to bind to antibody classes that do not have the affinity to Protein A, such as IgM and IgA. The selected recombinant protein L ligand used in the TOYOPEARL AF-rProtein L-650F resin is alkalistable and, therefore, able to withstand the high alkaline conditions necessary for clean-in-place (CIP). This resin exhibits stability in various solutions and over a wide pH range, as well as demonstrates excellent pressure flow-rate properties.